Multi-National Forces march in formation after the conclusion of the official opening ceremony of Cobra Gold 2017. 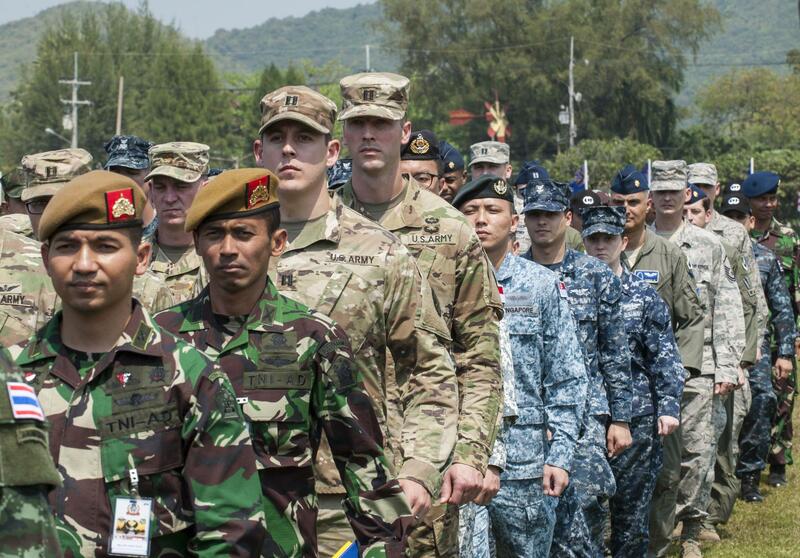 The 38th annual version of the Cobra Gold military exercises are wrapping up in Thailand. According to the U.S. Army’s Public Affairs Office at Indo-Pacific Command in Hawaii, Cobra Gold is “the largest military exercise in the Asia Pacific.” U.S. officials describe it as “co-hosted” by Thailand and the United States. 27 other nations are taking part to varying degrees from Japan and South Korea to Indonesia and Singapore. Even China is part of the exercises — at least the part that has to do with practicing a response to a large-scale humanitarian crisis. More than 4,500 U.S. forces have been involved — many of them based in the Asia Pacific. The events are broken into three segments: field maneuvers, civic assistance drills, and military staff exercises. While there’s no question this is a military operation, in the relatively recent past there have been diplomatic aspects as well. In the immediate aftermath of Thailand’s military coup in 2014, U.S. participation was scaled back, but it has now returned to previous levels. While U.S. relations with Thailand have had their complications, they also have a long history starting in 1818 with the Kingdom of Siam.